The History of the Ministry. This ministry arose out of necessity. In the early Church ordained clergy were in short supply and the restrictions on who could distribute Holy Communion were more relaxed. It was usual for a sick person to ask a friend to bring Holy Communion to them. One of the early martyrs, St. Tarcisius was killed while bringing Holy Communion to the sick as an acolyte. By the Middle Ages the pendulum had swung to the other extreme and the Ministry was restricted to bishops and priests – even deacons were classed as extraordinary ministers. This period was also marked by an infrequent reception of Holy Communion by the faithful who, although they might attend church every weekend, would only receive Holy Communion once a year, usually at about the Easter celebrations. This situation continued until the early years of the twentieth century when in 1905 Pope Pius X started promoting regular Holy Communion among the faithful. Following the liturgical changes of the Second Vatican Council and the restoration of the chalice to the people the Ministry of distribution Holy Communion was also opened up. Deacons, as ordained ministers of the Church, came into the fold of Ordinary Minsters of Holy Communion. The Council and Pope Paul VI felt it opportune to permit bishops to appoint lay people to assist with the distribution of Holy Communion as Extraordinary Ministers – extraordinary in the sense that they were ‘out of the ordinary’. The change was difficult for many older Catholics who had been brought up that only a priest would touch the consecrated host with his hands. The communicant would receive the body of Christ directly on their tongue – they would not even touch the sacred vessels. "The faithful who afre special ministers of communion must be persons whose good qualities of Christian life, faith and morals recommend them. Let them strive to be worthy of this great office, foster their own devotion to the eucharist, and show an example to the rest of the faithful by their own devotion and reverence toward the most august sacrament of the altar. No one is to be chosen whose appointment the faithful might find disquieting. The Eucharist is at the core of our faith. A minister is a person of faith, who believes in God, follows Christ and trusts in the Holy Spirit – and has a genuine love of the Eucharist so that they can share that love with their Catholic brothers and sisters. In carrying out their ministry they follow in the footsteps of the disciples obeying the Lord’s command feed the faithful (Mark 6: 31-44). The minister is someone who, through prayer and meditation, will grow, develop and deepen their own personal bond with the Lord concealed within the Blessed Sacrament. In addition to the spiritual journey that will deepen their reverence for the Eucharist you will be asked to assist with the distribution of Holy Communion, either the consecrated host or the Precious Blood, at the weekend or weekday Masses when there are insufficient Ordinary Ministers to fulfil that role. There is a rota, see link below, so for most weeks you will not be on duty. You can still attend your usual Mass and will not be asked to change your Mass going routine. In preparation for assuming this Ministry you will be asked to become familiar with the Church’s teaching regarding the Eucharist and its distribution – you will be handling the Body and Blood of Jesus Christ, a duty not to be taken lightly. Before you take up this Ministry you will be officially commissioned using the rite accessible by the link below and to renew this commission annually at the Mass of the Lord’s Supper on Holy Thursday evening. 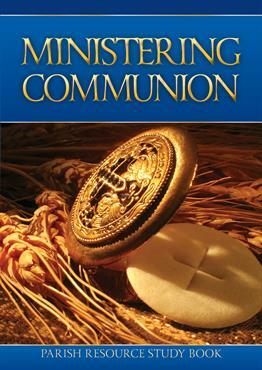 Kenneth A.Riley and Paul Turner (2007) - Guide for Extraordinary Ministers of Holy Communion. [The Liturgical Ministry Series]. Chicago. Liturgy Training Publications. Congregation for Divine Worship and Discipline of the Sacraments (2004) - Redemtionis Sacramentum; On certain matters to be observed or to be avoided regarding the Most Holy Eucharist. London. Catholic Truth Society. Text from the Vatican website. Catholic Bishops' Conference of England and Wales (2002) - General Instruction of the Roman Missal. London. Catholic Truth Society (PDF file). Peter J.Elliott (2005) - Ceremonies of the Modern Roman Rite; the Eucharist and the Liturgy of the Hours. Second edition. San Francisco. Ignatius Press. Available from the Piety Shop or Parish Office.